Vagrants expelled from Middlesex (1777-1786) by parish of origin, using the ‘Vagrant Lives’ dataset and the ‘GIS of the Ancient Parishes of England and Wales 1500-1850’ shapefiles. Parishes sending more than 20 vagrants highlighted yellow/green. Those arrested as vagrants on the streets of eighteenth-century London risked expulsion from the city, back from whence they came. The Vagrant Lives project has collected the details of 14,789 of these vagrants and produced a downloadable dataset which we would encourage you to reuse. 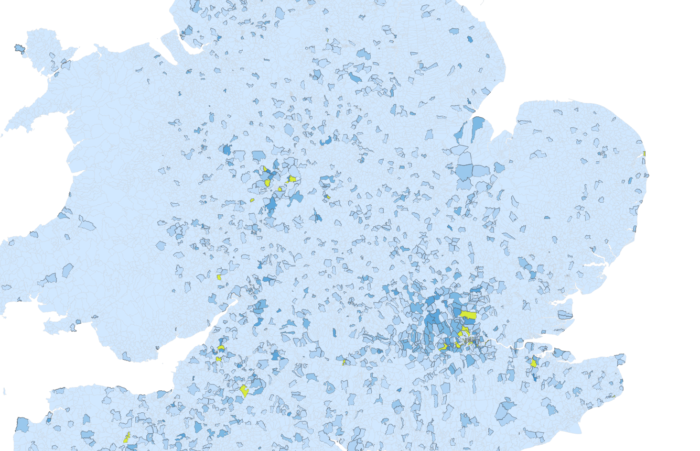 Using that dataset, this map was produced, which show us where London’s vagrants didn’t come from. Not intentionally; it was meant to show where they did come from. And you can see that by looking at the shrapnel-like outlines of filled-in parishes. But it’s the spaces between on this map that catch my eye. There’s remarkable regularity to the gaps that looks almost too perfectly diffused to be random. As if their distribution is the product of some intelligent design. There is a clear pattern to the places of origin of Middlesex vagrants on this map: a dense cluster in the parishes around London, slowly dissipating as you move further away. One of our aims with the Vagrant Lives project is to understand patterns like these, to help us gain new insight into what motivated people to make the decision to migrate to London, and what led others to stay home. Most migrants move only a short distance. Long-distance migrants go to one of the great centers of commerce and industry. Natives of towns are less migratory than those from rural areas. Economic factors are the main cause of migration. 127 years later we’re still turning to Ravenstein to think about migration, and I suppose we can see from this map that his laws might help us to suggest at least a partial explanation for the patterns we see. The dense cluster of migrants hailing from around London certainly adhere’s to Ravenstein’s first law that migrants tend not to move very far. The London on this map is clearly slurping up people from the surrounding countryside. But nothing in Ravenstein’s work explains how the parishes came to seem so perfectly diffused. Why one parish and not its neighbours? Perhaps its a product of chance; or of the distribution of the population across the landscape; or something else. Whatever it is, I think it’s beautiful, and I’m planning to find out. A caveat in case you intend to cite this map: some regions are mis-represented by this graphic. Our ability to ‘map’ someone here was contingent on our original source material telling us the name of the parish the vagrant had come from. This was common in England, but in Wales in the west, we more often know the county only. You can’t map counties on a parish map because you don’t have the required level of precision. And so it looks emptier than it should. We also suspect that we have better coverage to the north and west of London than we have to the south and east. So please cite only if you understand the underlying evidence, which can be found in the original dataset. Burton, N., Westwood, J. and Carter, P., GIS of the Ancient Parishes of England and Wales, 1500-1850 [computer file]. Colchester, Essex: UK Data Archive [distributor], March 2004. SN: 4828. E.G. Ravenstein, ‘The Laws of Migration’, Journal of the Statistical Society, vol. 52, no. 2 (1889), 241-305. Mark Healy, ‘Ravenstein’s Laws of Migration’, Harper College [http://www.harpercollege.edu/mhealy/migrat/xp/mgraven.htm].